But I ended up having to let it die because it was just too large to do all the necessary maintenance - watering and spraying and cleaning up dead fronds etc. I think it's all asparagus ferns for me from this point on. I think if I ever get rid of the messier plants I'll go with sansevieria, little care, no mess. "https://www.shabbyartboutique.com/2015/03/diy-chicken-wire-cloche.html "staple it to the porch or ground.? woke up to the pitter patter of their feet on the roof today. Thanks for the idea. Bet there's chicken wire in the barn. Did not see squirrels around here until the last few years. Weird. Grr the squirrels dig up everything I love, too. lol. Good thing they're so cute. I see you have a zygocactus and that is a lovely bush of rosemary! 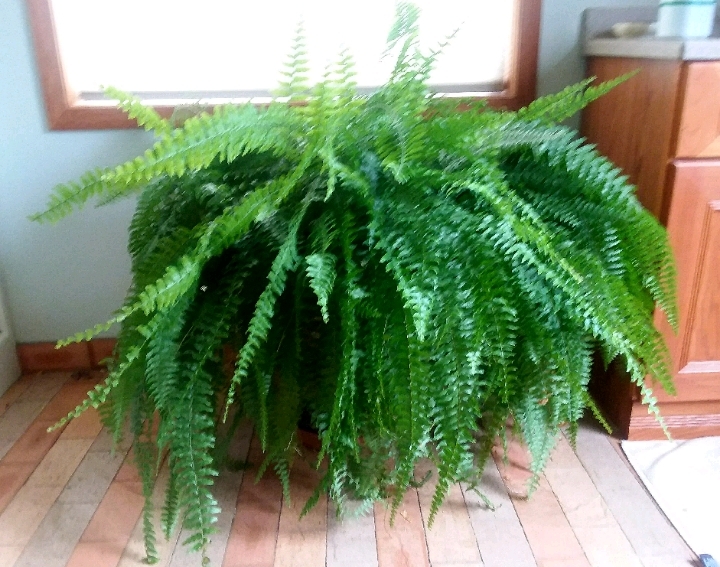 A very healthy-looking fern plant. That would be cool if your succulents flowered! Asparagus is yummy, so enjoy! And they do need checking everyday for growth, lol :) I'm imagining asparagus with steak. That would indeed be yummy! I was listening to a farmer today who was recommending people eat food from good soil eg back yards, organic and other small farms where the soil is good. Apparently, aside from a lot of food having glyphosate in it these days, which kills so much of out gut biota, food can have as little as 5% of the nutrients it had when tested in the 1920s or earlier. So, that's good that you have access to organic beef. I did not know the name of that cactus so thanks for that. Was given a start from a friend many years ago. Several of the succulents have bloomed, one back in the winter. Very pretty. Have to pick spinach today and check the asparagus. Waiting fir it to warm up outside. Yes we are lucky and the husband adds natural rock dust minerals to all the garden spots and raised beds. We are much healthier in the summer with all the veggies. I still put up stuff for winter too, but not as much as when all the kids were home. I have found out that you guys call it Christmas cactus, which is a good name for it, as it flowers around your winter solstice. Here it flowers in the middle of winter, whereas our Christmas is in summer. For your's to get so big, you must be a good gardener. I had one...until a chain broke and it ended up on the ground...where the chooks ate it. I was very sorry, because my MIL had given it to me. That will be nice when it warms up outside and you can get a spot of gardening in. Only a spot, mind you, don't overdo it again! Picking spinach and asparagus - how healthy! Ah, natural rock dust will work very well. Ok, I get it. Mine is quite old, from a start given to me by tge husband's grandmother. It only had a few blooms last year, don't know why. Sirry to hear about yours. Will definitely take it easier next time I garden, the recovery time is too long. You did very well getting that plant so big from only a start. Obviously you and your husband are good gardeners! Yes, rest up and get your health up. A bit of exercise every day is good, but not too much! I wish I could keep house plants, but I kill them. I would especially like a little herb windowsill garden! I have killed a few as well. I have an herb garden outside and I enjoy using the herbs in cooking. I've tried them inside but the rosemary is the sole survivor. She goes outside every summer. Lovely plants. I am especially impressed with the rosemary. 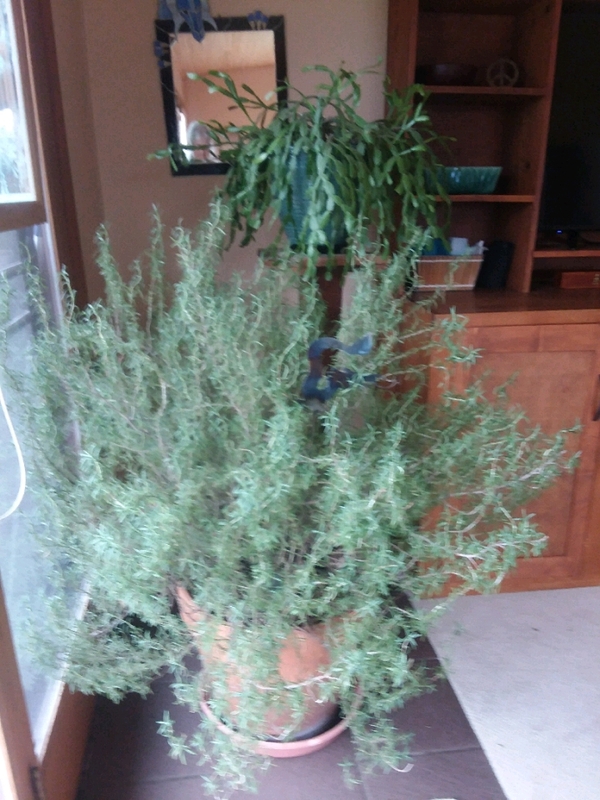 I have so much trouble with rosemary. I can never keep one alive more than a season, whether indoors or out. One of my friends has a hedge of it in front of her house that I would love to have. So how were the steaks? I wish we had the freezer space to buy bulk meat from the farms around here. I think this is the 3rd one I've had that has grown to this size. 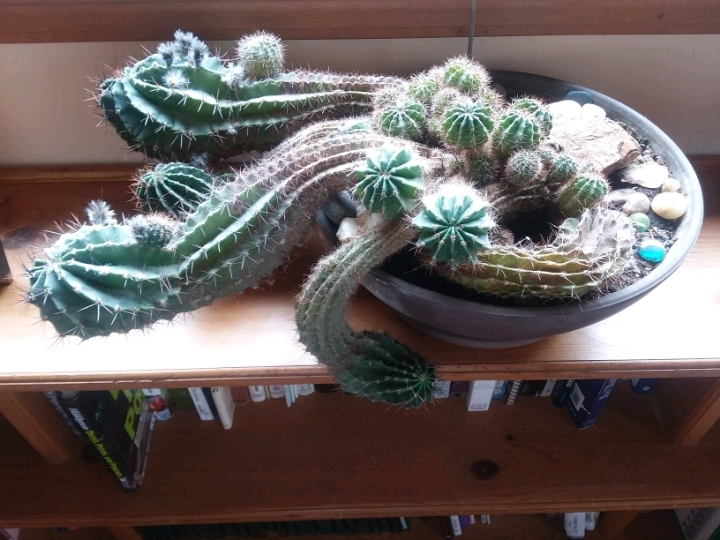 It probably needs repotting but if I did it wouldn't fit through the door to go outside in summer. Wonder how much longer the husband will be willing or able to get the big plants out to the deck. A hedge would be awesome, gets too cold here to grow something like that though. The steak was super good. We all agree better than last beef we had. It was older and had too much fat. We split the meat with our youngest so takes up less freezer space.